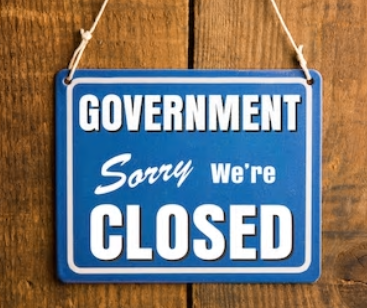 If 1/4th of the government is closed – i.e. not providing the services that I’m paying for (through my taxes) – shouldn’t I (we) be getting tax credits? Personal note: Every couple of years, I’ve “lost” my cable and internet services for a day or two. After the fact, I always call and complain … and ask for a credit. Usually, there’s the “act of God” brush-off, but when I keep up my whining, I always get something — usually a free movie or two. Precedent set! Let’s run through the arithmetic. For simplicity, let’s assume that the “shutdown” lasts 1 month. That means that means that we’re each losing about 2% of the government services that we’re paying for, right? (1/12 x 1/4 = 1/48 = 2%). Ah, but about 1/2 of the pay-deferred government employees are still reporting to work. So, cut the implied credit in half to 1%. Bottom line: we the taxpayers are entitled to a tax credit of 1% (of our annual taxes) for each month that the shutdown continues (assuming that half of the impacted employees continue doing their jobs). I’m betting the under on that one. P.S. The half of the country that doesn’t pay income taxes wouldn’t get any credit since – during the shutdown – they’re getting exactly what they pay for…. This entry was posted on January 14, 2019 at 6:59 am and is filed under Government, Government shutdown, Taxes. You can follow any responses to this entry through the RSS 2.0 feed. You can leave a response, or trackback from your own site. – Federal employees are paid by federal dollars; given so are these “taxes” a net add to the Treasury? may represent the Democrat base. Shutdowns are just another way to screw the taxpayers. We get no service and we never get the lost service back – but eventually the non working employees get paid. In some states the “furloughed non-essential” workers even get unemployment. If a private sector employee is furloughed they never get those wages back. Essential employees who are working shouldn’t have to wait for a paycheck. It’s Congress who shouldn’t get paid during a shutdown.